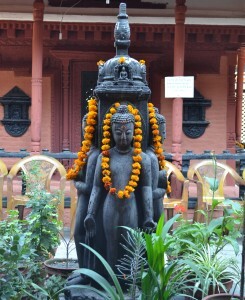 There are eighteen main Mahayana Buddhist Mahaviharas (Great Mahayana Buddhist Monasteries) in Kathmandu Metropolitan City. Among them Itumbaha is one of the oldest and most important and famous Mahavihara built at the center of Kantipur city i.e. Kathmandu in the middle of 11th Century AD. Its real and full name in Sanskrit language is Shree Bhaskardeva Samskarita Keshchandra Krit Paravart Mahavihara i.e ITUMBAHA (or Keshchandra Mahavihar) in short form and well known as in local language. Itumbahal is a prominent Vajrayana Buddhist Monastry, Itumbahal is a square shaped Buddhist Vihara, architecturally, it is one of the best preserved ancient Buddhist monastery. It inherited the history of more than 900 years old. Several renovations and restorations by different groups of people through the ages have been done to maintain its original beauty of Itumbahal. The main shrine of Itumbaha (the monastery) is square shaped (about 25 meter sq.) two storeys, old looking structure with typical Newari Architecture. Bricks, clay and wood are extensively used in the construction. While entering into the shrine one can see a temple like structure in the centre of the compound, with enclosed stupa. Behind this structure there is a Kwapadya (Buddha) facing east. The main shrine or monastery is surrounded by big Itumbahal court yard in the east, Tahanani in the west, Bakunani in the south and Taranani in the North.